At What Age Is It Safe For Your Child To Walk To School On Their Own? These days I often see sad stories about children who go missing on their walk to school and you can practically hear a collective sigh of relief from parents across the land if the youngster is found safe and sound. 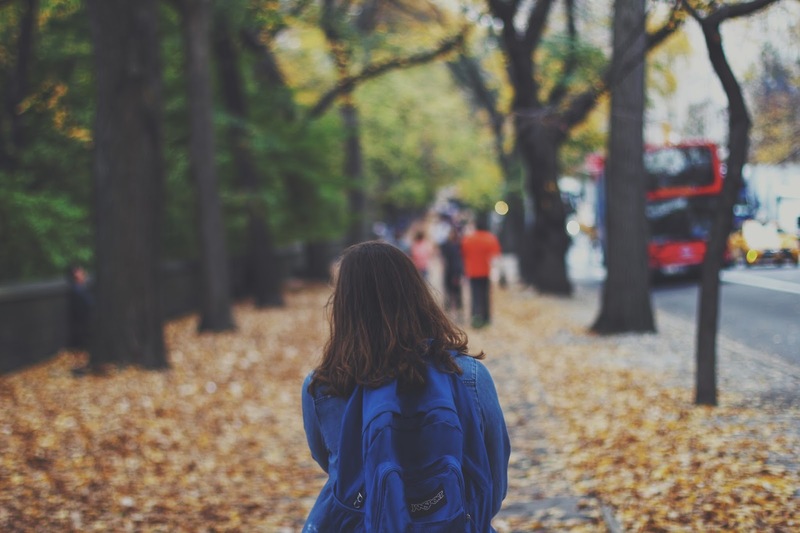 When is the right age to let your child walk to school on their own? It’s enough to make you think twice about letting your children go anywhere unaccompanied and raises the obvious question – at what age is it safe to let your child walk to school alone? Caitlin is 10 and Ieuan is 9 and although their school is a brief 15 minute walk away from our home, I still haven’t let them walk the whole way or back there without meeting them. And, frankly, after the recent horror stories of April Jones and Milly Dowler, I think it may be a while before I feel confident enough to let them go. For a start, there is the danger from main road traffic, although there is a wonderful lollipop man who is on patrol close to their school. Previously, although Caitlin and Ieuan were in the same school, they were on different campuses with a 10-minute walk between them. Now they are in years 5 and 6 they are back together in the same location but the daily start and finish times between the school buildings are staggered to allow time for parents and children to walk between the two sites. Some parents already let their Year 3 children (who finish earlier) walk the 10-minute walk between the two sites to meet their parents and siblings, relying on the nous of the child and the supervision of the lollipop man. There is no denying that, for the working parent, the school run is a hellish dash. Parking around both school sites is restricted, although you get the usual crew who seem oblivious to the meaning of a double yellow line (the bigger the vehicle, the more colour blind they seem to be, I find). You also get those who happily do a three-point turn in the face of on-coming traffic, forcing everyone to slow down or take evasive action. Even if it’s pouring with rain, there is little point taking a car because parking is incredibly difficult. Despite the fact that we are lucky enough to have a lollipop man, there have been at least 2 road traffic accidents involving injury to kids in the past year. So whilst I understand the pressure, personally, I won’t take the risk. And then there is the risk of violent crime. Now I know that statistically the likelihood of abduction or worse occurring is slim. But how could you live with yourself if something did happen? Even knowing it wasn’t my fault, I would forever wish I had been there to protect my kids. But we have to be pragmatic. We are going to have to let them go at some point, aren’t we? We cannot keep them under house arrest in the event that something terrible may happen. Already, kids spend too much time inside on iPads because many parents are too terrified to let them play outside unsupervised. When I was my daughter’s age, my sister and I spent most of our time cycling up and down the cul-de-sac we lived in. The Husband used to play in a nearby quarry with his mates. – Talk to the school bus companies to check that drop off points are as safe as possible. I am sure that there are many other things that could be done to improve safety for those kids who do walk on their own to school. Whilst I am against giving young kids mobile phones due to the possible damage to their developing brains from handset radiation, this is one situation where a cheap pay-as-you-go handset may well be worth the risk. I walked to school on my own when I was about 10 or 11 and that is quite early enough in my book. You may well feel differently or simply be unable to do the school run and get to work on time. Employers need to step up to the plate here and examine how family-friendly they are. I find that many firms will happily claim to be “family friendly” but it’s a different matter if you have to be late a couple of mornings or have to leave because your child is sick. Let’s be honest. There is absolutely no reason why many job roles need to be carried out between 9 am and 5 pm. If you are in a sales role, then that is different but many administrative functions can be carried out on a more flexible schedule. It might be worth talking to your Human Resources Department to see if there is anything that could be done to improve the flexibility of your working hours. When to let your children walk to school on their own is a very personal (and tricky!) decision but if we talk to the schools, the council and the police (e.g. a local community police officer), much can be done to make things a little safer. As parents, we should also be working together to look out for one another’s children. And we shouldn’t be afraid to speak up and report anything we see that is even vaguely suspicious. "Free And Bargain Books Linky 10/09/2018"